My boys are very close and always shared a jack and jill bathroom in each of our houses while they lived at home. I always liked the fact that they were just a door away from each other. Since they moved out years ago, I felt it was time for a face lift for their old bathroom! The white tile on the floor and in the shower had taken a beating over the years, so I scraped out the old grout and re-grouted the whole bathroom. It wasn’t a hard task, but a little hard on the knees and elbows! Below is the grout remover tool that I used by DEP. It worked perfectly! (I watched a tutorial on removing grout and re-grouting on UTube). After I finished regrouting, my husband switched out the tub and shower fixtures. The polished chrome looks fresh and new. I added new leopard print pulls to the cabinet doors from Hobby Lobby. The navy blue can easily be dressed up to suit feminine tastes too! By adding a few crystals to the chandelier and switching out the artwork and shower curtain and it could be perfect for girls! 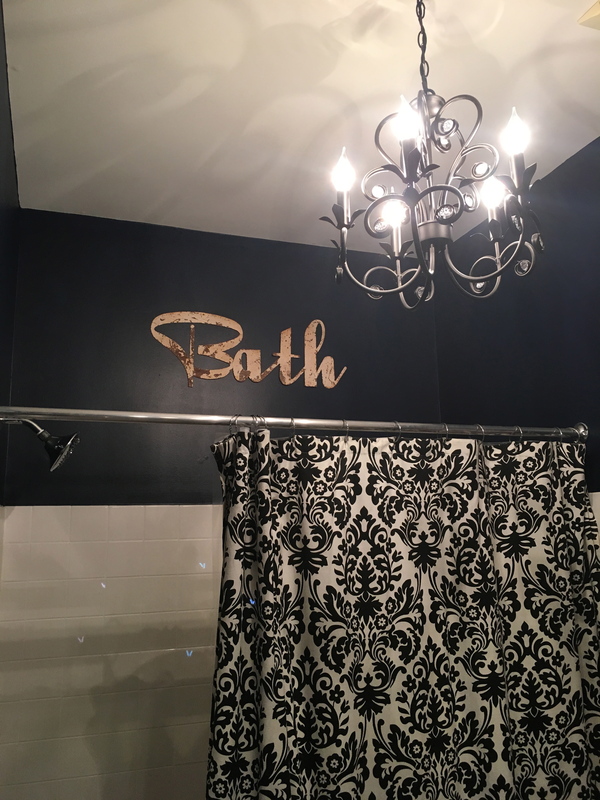 For very little money this bathroom got a quick and easy make over! When we decide to put this house on the market, it will be staged and ready to go! Chalk Painted Stool-In its new spot!